The Hollywood system couldn’t contain Francis Ford Coppola. In Tucker: The Man And His Dream, his dashing biopic about the forward-thinking automotive designer Preston Thomas Tucker, Coppola locates a figure and a subject—the strained relationship between a gigantic industry and one extraordinary individual—that dovetails with his own personal struggle working within the confines of the Hollywood establishment. (This struggle often links Coppola with Orson Welles, and there is indeed a lot of Citizen Kane in Tucker.) Pacing-wise, Tucker amounts to one long sprint—a breathless array of wipes, clever cuts, low angles, and energetic dollies—but Tucker’s predicament, his absolute inability to conform to rigorous corporate structures, is a deeply serious one for the director. 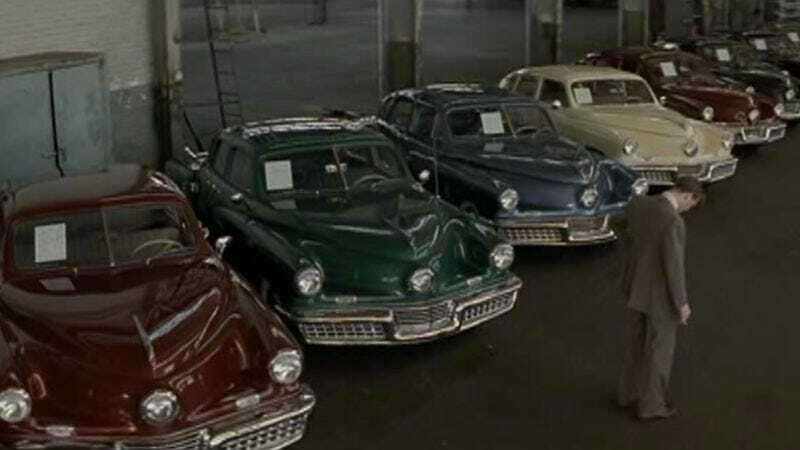 What makes Tucker an uplifting movie is not merely its winning Capra-esque spirit, but Coppola’s unwavering belief in the impulse to create: At the end of the day, even though only 50 Tucker cars were ever manufactured, and even though Coppola’s recent movies have become progressively more under-seen, the role of the inventor is a calling that must be embraced. Tucker begins in Ypsilanti, Michigan, in 1945, with Jeff Bridges—in a typically boyish performance of ear-to-ear grins—playing Tucker. Coppola introduces a tone heavy on mid-20th-century American nostalgia: living rooms overrun with lively children, a smiling wife (Joan Allen) with cherry-red lipstick, twilight drives to the drugstore for post-dinner ice cream. With the help of his motley team of advisers, engineers, and loved ones (including Elias Koteas, Martin Landau, Christian Slater, and Frederic Forrest, from Coppola’s ecstatic One From The Heart), Tucker unveils the plan for his ambitious rear-engine vehicle, the Tucker Torpedo, which he describes as “the car of tomorrow, today.” Tucker milks money from investors not with a finished product, but with grand showmanship and an emphasis on the idea itself: In the movie’s most riotous set-piece, Tucker woos his audience with girls (“the Tuckerettes”) and empty chatter as his crew scrapes together a presentable Tucker model backstage. Tucker knows that the car doesn’t have to work to win over the crowd—it just has to make them drool. Availability: Tucker: The Man And His Dream is available on DVD from Netflix or possibly your local video store/library. It can also be rented or purchased through the major digital outlets. Note: Although the movie was theatrically released in the 2.35:1 format, Coppola and DP Vittorio Storaro converted the home-video transfer to 2.00:1.